"Is it possible to read comics on my new iPhone 3G?" was the first question on my mind after I finally got my hands on my new geeky gadget. I bet with all the new iPhone apps, somebody makes a .cbr reader for iPhone, right? I got the iPhone 3G because it's a tiny little Internet browser (I don't even use it as a phone right now). I'm kind of addicted to reading the various comic book blogs, and I love the idea of being able to surf the comic-blogosphere while waiting in line or during bumper-to-bumper traffic. Kidding on that last one. For now. I decided to see if I could find out how to read comic book scans on my iPhone. First stop: see if there is a comic book reader iPhone app that does the trick...hopefully an iPhone app that can read cbr cbz and pdf comic book scans. A Google search brought up a couple candidates, but they're hacks that require you to "jailbreak" your iPhone (in other words, hacking the iphone software and reprogramming it yourself). Look...I just spent a good chunk of change on this pretty gizmo...I'm not interested in "cracking" it! Nope...not going THAT route. Good idea, but when I viewed the comic pages on the iPhone, I found them to have been magically degraded in resolution...so much that images were too blurry to comfortably read. What gives? Turns out that the iPhone automatically "optimizes" (=ruins) the images when you import them. No workaround for this yet. PDF files don't get degraded when you import them into your iPhone, but the iPhone needs a native PDF reader even more than it needs a comic book reader application. The only way to get a PDF file into your iPhone right now is to email it to yourself and read it as an attachment. I don't want to wait for a 35Mb download over the iPhone's bandwidth. Not a viable solution IMHO. Lastly, I used screen-capture software to take screen-caps of the individual panels of a comic story. I used SnagIt (which I love dearly...it's like Photoshop for screengrabs) to capture and compile a folder full of single-panel -- or sometimes single-tier -- images which I then put in a folder and synced to the iPhone. This approach actually produced a nice readable iPhone comic! The only problem with this method was that it was extremely tedious and time-consuming to make individual captures of all those panels. Sigh. All of the images above are panels from Foxy Fagan #1, imported into the iPhone by the last method I described. I'm sure there's gotta be a better way... if any of you readers have any suggestions on how to read comics on an iPhone, I'd love to hear about them in the comments section! iPhone: Your New Comic Shop? all about "Peanuts: A Comic Book History"
"It was fandom's first known attempt to collate all the information together about the comic book appearances of Schulz's Peanuts characters." Duck Dodgers' Classic Cartoons Blog! Click on the splash page above to go see all FIFTEEN delicious pages of funny-animal super-heroics courtesy of Duck Dodgers! There's lots of other comics and cartoons to look at when you get there, so get ready for some good ol' fashioned classic cartoon fun! ...and now as a remedy to the horrible funny animal comics I posted yesterday, I'd like to share a link to a really cute Funny Animal comic book story by Sheldon Mayer. From Kevin Langley's Cartoons, Model Sheets & Stuff, here's Dizzy Dog! I love this hapless rabbit flying by while still drying his dishes. It's a fun story with a simple set-up...but it's the joyful drawing and storytelling by Shelly Mayer that makes reading this story feel like a cool breeze on a summer day. Go take a look at Dizzy Dog! ...and there's a nice overview of Shelly Mayer's life and work at Thad's Blog. There are a lot of links to more comic scans and other Shelly Mayer goodies to browse thru.Go take a look! Funny animal comics aren't supposed to be this creepy and scary. I feel like I'm recovering from a concussion or from food poisoning when I read this. It's not just horribly written, but the bad drawings are strangely compelling. Dig that crazy tangent in the fifth panel of the last page. Ouch. In case you thought the whole comic can't be this bad, here's a Prof. Nudnik one-pager from the same comic that'll make you go, "Huh?" Umm...yes. That's it. End of story. Okay...Check back tomorrow for some really GOOD funny animal comics...I promise! A number of months ago, after posting a bunch of Dan Gordon comic stories on the CartoonSNAP blog, I got an email from Michael Dean, the editor of The Comics Journal. He asked to borrow some Dan Gordon comic books so they could scan them and run the color pages in an upcoming issue of the magazine. Of course I said YES because I would love to have a part in helping comics readers discover the unbridled joy of the comic art of journeyman cartoonist and animator, Dan Gordon. The Comics Journal made super-high-resolution scans of Cookie and Funny Films for inclusion in their full-color comic-reprint section. I can't wait to see what it looks like. They even asked me to write an introductory article for the section -- only problem with that was I didn't really know that much about Dan Gordon's life. So I put out a call for help! Fortunately, there are a lot of cool cartoonists and comics-aficionados who were more than eager to help me fill in the gaps. Thanks to: Mike Kazaleh, Kent Butterworth, Scott Shaw, Leonard Maltin, Mark Kausler, and Milton Knight, who were all very generous with their time and knowledge. Of course, any shortcomings that may be in the article are mine, but there's no doubt that the big Dan Gordon comics section will look fantastic! The Comics Journal #291 comes out TODAY... Wednesday July 16th, so If you'd like to have some full-color Dan Gordon comic book reprints on real paper (rather than reading them on your computer screen), make sure to pick up issue #291 of The Comics Journal at your local comics shop, bookstore or Amazon.com. I just looked through the finished printed copies of the book on the stands at my local comics shop, Burbank's awesome House of Secrets. Bottom line: Fantagraphics did a great job with the reproduction and printing. The comics look sharp and clear, but still retain that "old comics" yellowed-page look. 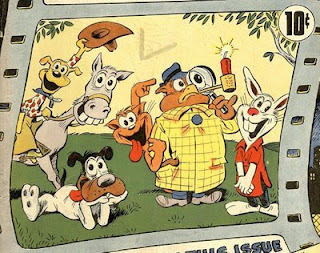 There are 32 full-color pages which include a Cookie story, two funny animal comedy comics starring Puss and Boots from ACG's Funny Films, and one story of the rabbit inventor, Blunderbunny! George Carlson worked on a completely different plane than his cartooning contemporaries. 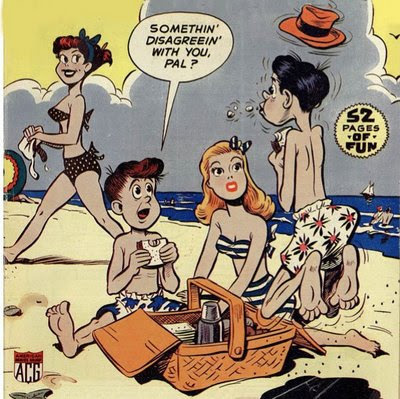 The fanciful cartoon worlds that he created for Jingle Jangle Comics look fresh and new even after 65 years! This opening panel really gets you ready to dive in to his nonsensical fairy-tale comedy adventures! 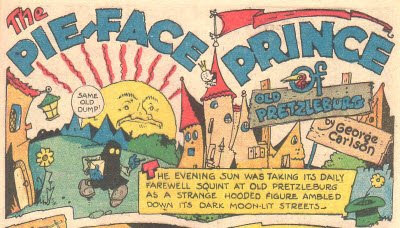 The Pie-Face Prince of Old Pretzleburg was a series that ran in George Carlson's Jingle Jangle Comics from 1942 to 1949. This untitled episode is from issue #6, December 1943.
and that cute little hat on the sun. George Carlson's beautiful panel and page layouts. Truly a feast for the imagination! Supermouse has his first adventure in this comic book scan from the outstanding Nedor-a-Day comics blog! Here are some other Supermouse adventures online. The pictures below link to Supermouse scans at the Asifa-Hollywood Animation Archive and Pappy's Golden Age Comics Blog. Take a look...they're loads of fun! Funny Animal Comic Book Scans from Thad K.
In the last few months, Thad K's classic animation blog has featured a beautiful pile of funny animal comic book scans by some of the greatest cartoonists of the golden age of cartoons! Here's a quick set of links to help you find and devour them! 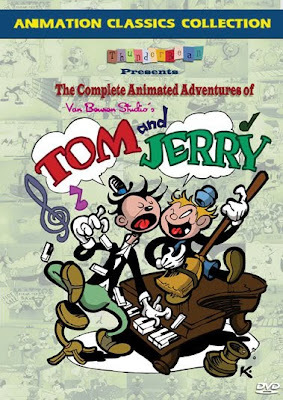 and there is a whole LOT more, too --especially if you're a fan of classic animated cartoons!